My recent trial of a Nokia E6 reinforced something I’ve suspected for a long time. The current fad of removing navigation controls like arrow keys, D-pad, trackball or touchpad from touch screen phones is bad for usability. Designers seem have fallen in love with the idea of a smooth, all-screen front face on their devices, which means removing as many buttons as possible. Important functions that can only be accessed by tapping a tiny image link with a too fat finger. Radio buttons and check boxes that don’t toggle reliably when tapped. Drop down menus that won’t drop down. Problems with hidden links and buttons not appearing as they are supposed to when you mouse over them. Accidently clicking links when scrolling. It’s too hard to accurately select text to copy from a Web page. Difficulties in positioning the cursor precisely for editing in a text box. Problems scrolling through text that’s longer than the text box or text area it’s displayed in. You could argue that it’s up to web publishers to fix their sites so that they work well in all browsers. But that’s not going to happen anytime soon. I believe it’s the job of device and browser designers to come up with touch interaction paradigms that work with today’s web sites. Some like iOS do a fairly good job. But most do not. On the other hand, both the Symbian Anna browser and Opera Mobile 11.1 on the E6 implement an on-screen mouse cursor that’s controlled by the arrow keys. It’s a simple, intuitive solution that works far better than any touch only alternative, particularly on sites that use mouse-overs to un-hide navigational elements. The Android, WebOS, N8 and bada browsers I tested are rather old but they are the latest that run on my phones. I’m hoping the Anna browser which is due out this month will be more usable on the N8. 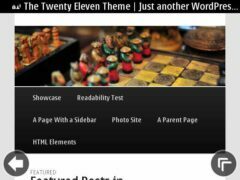 This entry was posted in Uncategorized, Usability and tagged mobile browsers, Nokia E6 by Dennis Bournique. Bookmark the permalink. I do not agree with the premise of this summation. Touchscreen phones are much easier to use, more intuitive, and faster. I’d choose a touchscreen-only device any day over one with hardware keys. I think Dennis Bournique needs to appreciate the fact that there is not much inherently defective in the touchscreen mode. I shall show that it is actually superior over physical QWERTY, and the current trend even proves it. He took the time to enumerate what he does not like with the touchscreen – but most of those points hold NO water! I shall address some of these. – the problem is NOT with the touchscreen as an input system. The problem is with the dumb software designers that do not try and actually USE the products they design BEFORE pushing them out. There are SEVERAL touchscreen apps that have no such issues. Dennis may want to try out the more recent incarnations of Uc Mobile (in ‘ADAPTIVE’ model) – as a sterling example. This is – still-merely a matter of choices made in the software design process. Nothing stops you in adopting the Uc Mobile approach of – click the first time to gain focus; then click again to select. It works. ‘too hard to accurately select text to copy from a webpage. Really? Has Dennis tried out the new Opera Mini 6.1? Uc Mobile 8? On ‘touch’. Copying is a breeze here. There is NOTHING wrong with touch input. It is inherently superior to physical QWERTY. What software designers need to do is to retrofit their apps to make wise use of the wider screen ‘real-estate’ available to them. Anybody writing an app for touchscreen should take a look at the best touchscreen apps around, and borrow LEAVES from their software design methodology. It is no accident that the fastest entry on a phone – by ANY human – was on a touchscreen device using ‘Swype’. Let ANY ‘Physical QWERTY’ protagonists equal THAT RECORD, and I will do a VOLTE FACE! To help Dennis, I could say that touchscreens consume relatively more battery power. I will agree to that. His other points, while valid, are NOT attributable to ‘touch’ as a system! To re-emphasize, the problem is not with ‘touchscreen’ as an input system – per se. THE PROBLEM IS WITH THE SOFTWARE DESIGN(ER)s.
Why do I prefer ‘touch’ – over ‘physical’? Input is faster (with an input system like ‘Swype’). The inaccuracy is not the touch’s problem. It IS the software’s. Drag$Drop / Swiping functionalities – allow you do more – faster. Permit me to add one use-case scenario that ALL touch-based browsers that I have used – including the iOS browser – fail. 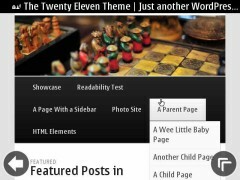 In the Widgets menu in WordPress, try dragging a widget from one box to a sidebar. I never got it to work even on the iPad running the latest version of iOS.